DugsWelcome.com is committed to safeguarding and preserving the privacy of all visitors to our website. We therefore use secure SSL encryption on all pages of the website to ensure any data submitted by you cannot be read by third parties. If you set up an account and log into our website, all pages you visit are also encrypted with SSL. You can confirm this by viewing and clicking on the padlock symbol in your browser. You can check the reputation of our website at Web of Trust which is based on user ratings. – If you subscribe as a member in order to use the additional features on our website, such as our interactive maps and location search, we will set up an account and store your email address, username and your full name (if provided) as well as details of the payments you have made. This information is not passed to any third parties. You can update your email address, name and password at any time by logging in and visiting your profile page. You are unable to change your username. You can cancel your recurring subscription at any time by logging in and visiting your profile page. If your account expires and/or is cancelled, your account details will remain in our database until we obtain a request to delete your data or a set period of time has elapsed. If you wish us to delete your account and all associated personal data, you can make this request via our contact form at any time. If you wish to request information about the specific personal data we hold on you, you can make this request via our contact form at any time. c) The status of your account has changed for example when your account becomes “active”, “cancelled” or “expired”. Note these will be automatic system emails. d) In order to ensure you have time to make changes, we will email you prior to requesting a recurring payment (this is also an automatic system email). You will therefore receive an “advanced notice” email confirming when the next payment will be taken. We do not have sight of any passwords you create from within our normal administration panel. These are stored securely in our database and encrypted. These can be reset at anytime by the account holder via the profile page. 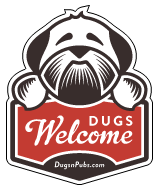 – If you email DugsWelcome.com, request a sticker or submit a listing request, we will collect and store the information you provide in your submission form. This is necessary in order to carry out your request. We do not pass this information to any third parties. We can at anytime log into our Mailchimp account and send updates or emails to all users that are subscribed to our mailing list who have provided consent to be emailed in accordance with GDPR guidelines. However we will never send emails which would be considered spam and we will never send an excessive volume of emails to our users. We will only send occasional emails which means no more than 1 or 2 emails per week. All emails that we send will only be for important or useful information relating to our website, events or merchandise. – If you make a payment to Dugs n’ Pubs (i.e. purchase merchandise or subscribe as a member), we use Paypal or Stripe to securely collect and process your payment. We do not have any access to your actual full credit or debit card details or account passwords as this is not provided by the third parties. We will receive your name, address, email and information on the items you have purchased in order that we can arrange for delivery of your items (or activate your member subscription). We will not at any time pass this information to any third parties. It is used only to enable us to complete your order. If you purchase an item from our online shop and provide a postal address, these details will be saved in our database. Please also view our policy with regards photos that you may send us via email or a social network. – If you are a “Big Dug” member and have downloaded the Android app from Google Play, you can use your website login to log into the app. If you log in, a login token is held in localStorage on your phone. This remains on your phone until it is cleared (by uninstalling the app). The reason it is stored is to ensure that you only need to log in once (as long as you don’t log out).